Sideswipe Brewing is one of the new breweries on the Columbus craft beer scene. Their beers started appearing in select area beer stores in December of 2013. Sideswipe makes three beers, Fisticuffs IPA, Elegant Hoodlum Smoked Stout, and Coop Looter Saison, all of which are distributed in 22 oz bottles. Back in January I did a review on Coop Looter, which really impressed me. Subsequently I’ve tried but not reviewed Fisticuffs IPA. It’s a solid IPA, but there are so many great Ohio brewed IPAs that it didn’t stand out for me. 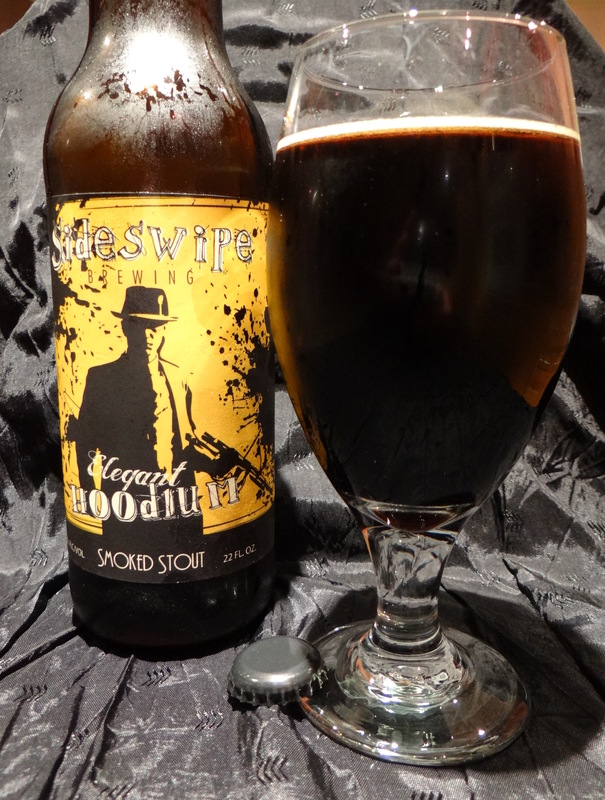 Here I review the third Sideswipe beer, Elegant Hoodlum Smoked Stout. This black beer manages to absorb nearly all of the photons that enter its darkness, only the slightest ruby highlights get through on the periphery. A vigorous pour yields a beige head that only amounts to 1 cm or so and dies off quickly. The aroma is straightforward chocolate from the roasted malts, but the taste is anything but simple. Chocolate is the first sensation that hits you, followed by unmistakable smoky notes that appear in the mid-palate and linger through the finish. It leaves you with a hint of hop bitterness and smoky, ashy flavors from the smoked malts. Each drink starts out a little sweet, but there are enough hops to keep the finish dry. I did not tire of the beer as I worked through the 22 ounces. The mouthfeel is creamy, but it could use a little more carbonation in my book. Like Coop Looter Saison, I think Sideswipe had created another tasty locally brewed beer that occupies a pretty unique spot in the Ohio beer scene. To be honest smoked beers aren’t really my thing, but I quite enjoyed Elegant Hoodlum. It combines tasty chocolate flavors and aroma with enough smoked flavor from the malts to add needed complexity. It avoids tasting like a campfire or being too cloying. If you live in Central Ohio and enjoy stouts this is definitely a beer to try. I’d love to try this one on nitro (if it is served that way anywhere leave a comment below). Out of the bottle I’d rate it below Coop Looter but above Fisticuffs IPA in the triumvirate of Sideswipe beers. A list of where you can find Sideswipe beers can be found on their website.